Forty years ago today – on January 30, 1973 – KISS performed their very first concert at Popcorn (The Coventry) in Queens, NY. The band performed 2 sets at the club that night for a crowd of under 10 people. The original lineup of Gene Simmons, Paul Stanley, Ace Frehley and Peter Criss grew out of the ashes of pre-KISS band Wicked Lester. 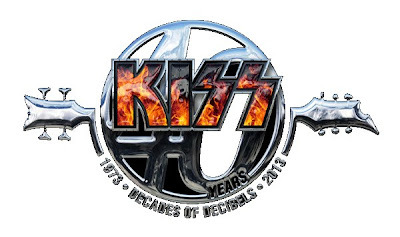 Four decades on, KISS is still rocking a legion of fans that number in the millions around the globe. Now 40 years strong, Paul, Gene, Tommy Thayer and Eric Singer prepare for their "Monster" world tour in 2013. "Our journey and victories are a joy I also share with you, our fans who have always given us the freedom to stand and fall on our own terms, and we have done both with a grateful smile,” Stanley continues. “For the past ten years, Tommy and Eric's pride and dedication have enabled Gene and I to reclaim and celebrate all that we have been, while continuing to move forward in a way that would have been impossible without them. I love playing with the band as it is today, and many of my proudest moments are tied to moments of magic we have created together in the studio and on the stage. I know we're ready to do it again." Gene offers appreciation "To the Kiss Army — who made it all possible for us. To Paul, without whom I would never have been able to achieve my dreams. And to the band — past and present — for continuing to treat the stage as holy ground and the fans as our bosses. Here's to another 40 years!" "At 40 years strong, I'm proud to be in one of the greatest bands in rock history,” says Thayer. “KISS is a band that is as full of life and vitality today as it was 10, 20, 30 and 40 years ago. All eras of the band should be celebrated today. Long live KISS." "A special thanks to all of the fans who have been with the band on this roller coaster ride called KISS for 40 years!,” adds Eric. “I am honored to be a part of this machine and pay special respect to all members past and present. I especially want to thank Paul, Gene, Tommy and [manager] Doc McGhee for giving me a place to call home. And most importantly the fans. YOU fuel this engine!"